Exclusive Networks, the value-added security and technology (VAST) company, has announced new partnerships with Imperva and LogRhythm that have been forged in response to the growing cybersecurity maturity of Asian markets. The company also recently acquired Transition Systems Asia, a value-added distributor, as part of its expansion into Asia, including the Philippines. In the Philippines, the importance of securing citizens against cyber threats is strongly emphasized in the “National Cybersecurity Plan 2022”. This five-year strategy from the Department of Information and Communications Technology (DICT) seeks to raise the country’s cybersecurity awareness and capabilities to global standards. In crafting the plan, DICT recognizes the importance of protecting every single internet user as well as the Philippines' critical information infrastructure (CII), government networks, small and medium enterprises (SMEs), and big businesses and corporations. By expanding its operations in Asia and the Philippines, in particular, Exclusive Networks is using its unique capabilities to enhance the region’s cybersecurity posture and foster its own transformative strategy through traditional distribution channels. Exclusive Networks accelerates market entry and growth for innovative cybersecurity, networking and infrastructure technologies. It works with thousands of reseller companies around the world to boost their business opportunities in cybersecurity and achieve new revenue streams within the changing technology landscape. Exclusive Networks continually challenges traditional VAD models, redefining value and creating differentiation. It promotes ‘Disruptive Distribution’, responding to new demands and prospects driven by more than entrepreneurial spirit. Exclusive Networks thoroughly screens and analyses hot new vendors before taking the best on-board. Its extensive knowledge of the market allows it to understand emerging trends and opportunities which its partners can then convert into profit-making businesses. One prominent advantage of this unique disruption of the supply chain is that each national and regional Exclusive Networks business unit is free to react to its own instincts, applying its market experience and cultural awareness, without beingconstrained by bureaucratic hierarchies. These units are easier to do business with and act faster than other resellers. Imperva is a leading provider of data and application security solutions that protect business-critical information on-premises, in the cloud, and across hybrid environments using best-in-class solutions. Imperva’s SecureSphere, Incapsula, and CounterBreach provides granular visibility into how users access data and applications, and uses sophisticated user tracking and classification to detect and block cyberattacks, botnets, unauthorized users and malicious insiders while ensuring compliance. Imperva is the leader for four consecutive years in the Gartner Magic Quadrant for Web Application Firewalls. Imperva’s application security protects your websites, infrastructure and name servers from low-and-slow and volumetric DDoS attacks 24/7 with web application security testing. It blocks SQL injection, cross-site scripting, and remote file inclusion so your web applications stay secure. Imperva uses multiple security methods like dynamic profiling, rate limiting, and access controls to safeguard vulnerable APIs and mobile applications. LogRhythm pioneered Threat Lifecycle Management (TLM) technology, empowering organizations to rapidly detect, respond to and neutralize damaging cyber threats. The TLM platform unifies leading-edge data lake technology, artificial intelligence, security analytics and security automation and orchestration in a single end-to-end solution. It combines people, process, and technology, empowering the cyber team by sorting through the noise to highlight and investigate high-priority threats. LogRhythm serves as the foundation for the AI-enabled security operations center, helping customers secure their cloud, physical and virtual infrastructures for both IT and OT environments. Its data security and management functionalities allow visibility on all devices and monitor the logs of each device on possible threats using its unique security intelligence analytics SIEM platform. The LogRhythm Platform uniquely delivers effective end-to-end TLM—from forensic data collection and analysis, through neutralization, to full recovery. It can be easily tailored to help companies meet specific security needs and scale alongside as the organization matures. LogRhythm’s core Products are LogRhythm Enterprise, a unified, scalable solution for large organizations and LogRhythm XM, an efficient, affordable packaged solution tailored to the needs of small and medium-sized enterprises. For enterprises looking for a solution to detect known and unknown user-based threats, LogRhythm’s User and Entity Behavior Analytics(UEBA) detects anomalous user behavior via machine learning(ML). The solution augments the team’s current security environment, accelerating detection and response so organizations stay ahead as cyberthreats rapidly evolve. “Our expansion into Asia and the Philippines, is part of our overall VAST strategy to be a global leader for various areas of information technology, including cybersecurity. We believe this presents an excellent opportunity for us to promote and establish our disruptive distribution strategy in new markets. “We are confident that our new partners Imperva and LogRhythm will add significant value to our current mix of innovative solutions and technologies. At the same time, their contributions will strengthen our corporate direction; to be an end-to-end solutions provider that meets local needs and demand,” said Renato Garcia, country manager, Exclusive Networks Philippines. “With this partnership, Imperva will be able to recommend tailored cyber security solutions to the Philippines market. 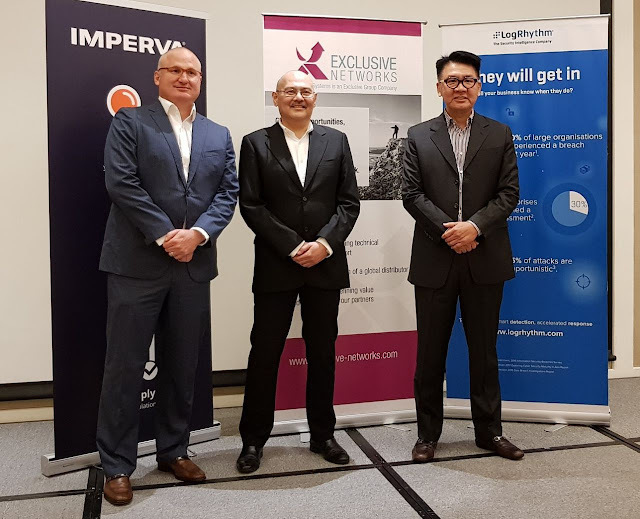 I believe that this partnership with Exclusive Networks will provide better local coverage and service to our clients,” said Andrew Draper, Area Vice President for Asia.